With Mindful Chef, you can take your food appreciation to new heights. 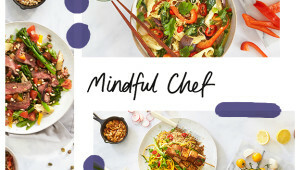 Letting you discover and play with flavours, combinations and even foods unknown, there is nothing better to help shake up your humdrum dinner menu than by getting introduced to Mindful Chef. Crafting boxes that contain the exact amounts of the most delectable of ingredients so that you can indulge in some true culinary delights in your own home - Mindful Chef has you, your time and your health in mind - in each box you will find nothing but nutritional deliciousness. Mindful Chef is an ambassador for those who may feel limited when it comes to eating healthily. With indulgent recipes, full of authentic flavours, aromatic spices, colours and vibrancy - proof is in the pudding here that going healthy is everything but limiting. Perfect for vegans and the gluten-free, as every meal is naturally free from dairy and gluten containing ingredients. It doesn’t get fresher than this, with ingredients that are sourced straight from West Country farms, to your door for you to enjoy with speedy prep included. Surprise yourself or another, Mindful Chef is your secret weapon to clean and happy eating. How do I use my Mindful Chef discount code? You can get a nutrition plan and plenty of healthy recipes to fuel you through each day by entering your email on the Mindful Chef homepage. What is the minimum subscription at Mindful Chef? There isn’t one! You can pause or cancel your deliveries so long as it's before the Thursday cut-off before the produce is ordered from the farm. Are there vegan-friendly options at Mindful Chef? Yes, there are plenty of delicious menu options which are, naturally, vegan. Do I need to be home to receive my Mindful Chef box? No waiting around involved here, your driver will leave your box where you request and if it can’t be left safely, they will attempt delivery later on or the next day. Delivery is free on a Sunday for those situated within the M25, and on Mondays for the rest of the UK. If you aren’t 100% happy with your Mindful Chef box, let them know and you’ll be issued another box or refunded. Email hello@mindfulchef.com or use the live chat. If you love delicious food that’s also great for your health and overall well-being - Mindful Chef is a food box company with a difference. Now you can get imaginative in your everyday cooking and start to enjoy a greater variety of food for less with a Mindful Chef discount code from us. While ease and convenience is built into every box - Mindful Chef also delivers above and beyond with fresh ingredients, innovative recipes and optimum nutrition for everyone to enjoy. If you thought you’d be stuck for what to cook tonight, think again and check out the recipes online at Mindful Chef. Sharing’s caring, and Mindful Chef posts every food box recipe online for all to enjoy. Asking for only 10 ingredients or less and only requiring half an hour’s preparation time - this is your ticket to dinner time innovation. Free from nasties while naturally gluten and dairy-free too, this is perfect foodie inspiration! We are big fans of the Mindful Chef box for 2, perfect for couples, friends, and even for those who like leftovers for lunch. With each box, you’ll get the freshest of ingredients which are sourced straight from the farm, so save with a Mindful Chef voucher and get stuck into super healthy recipes, with no compromise on taste or time. Enjoy different cooking styles, all of which are gluten-free and without refined carbs to keep you feeling energized. With Vegan options too - everyone can enjoy more of dinner time with Mindful Chef.